Trump said Friday night that Sen. John McCain's "no" decision on Graham-Cassidy came as a "totally unexpected thing, terrible." Trump added that Sen. Luther Strange, who he's rallying for tonight in Alabama, said he would have his vote on health care. Compared to his opponent, Roy Moore, Strange is the establishment candidate, but Trump told Alabama residents that Strange "is determined to drain that swamp." He added, referring to Republicans in Congress, Strange "doesn't know those people. He's never met them." If Moore wins against Strange, Trump said he would "be campaigning like hell for him." "No, Russia did not help me" win the election. Chuck Schumer and Nancy Pelosi are "very nice." "The wall is happening...What I do best? I build." 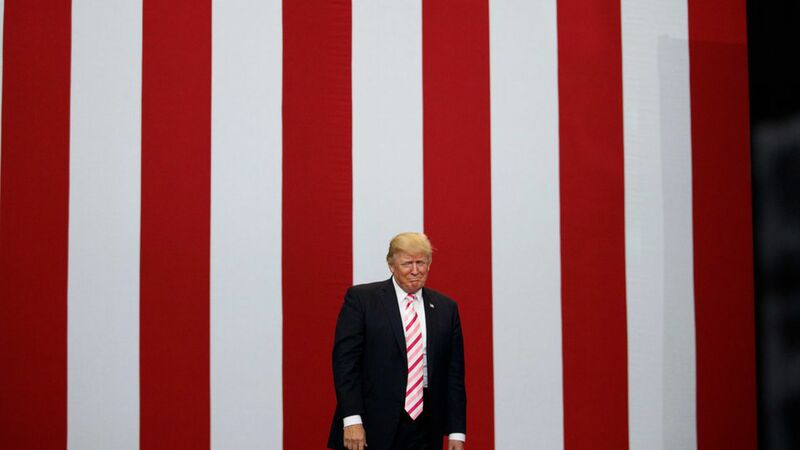 On 49ers quarterback Colin Kaepernick and the American flag: "'Wouldn't you like to see one of our NFL owners, when somebody disrespects the flag, say, 'Get that son of a b***h off the field,'" Trump asked. On the UN: He called his week at the UNGA "very productive" and seemed surprised when the crowd had an outburst of cheers. He added, "the world is starting to respect the United States of America again." On Kim Jong-un: Trump assured the audience he would protect America against North Korea's threats, and called Kim Jong-un "Rocket Man" again. Trump threw punches at "crooked" Hillary Clinton and the media. The scene: Trump walked out to "Sweet Home Alabama," smiling and hugging Strange after his brief introduction. As soon as Trump started speaking, he was interrupted by chants of "USA." The runoff between Strange and Moore will take place September 26. The winner will run against Doug Jones.